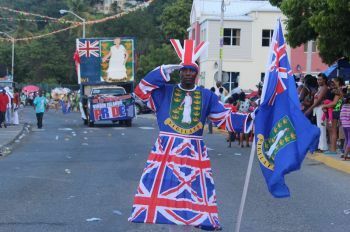 ROAD TOWN, Tortola, VI – Minister for Education and Culture Honourable Myron V. Walwyn has upped the call for a greater participation of locals in the this year’s Festivals celebrations even more so from schools across the Territory. He said that increased participation was one of the goals of the 60th Anniversary Committee and every effort was being made to involve all the various sectors of the community in the celebration. “We would like to see more local participation in all the activities,” Hon Walwyn stressed. An invitation was also extended to the churches to participate in the parade. Hon Walwyn noted that emancipation celebrations started with the churches and it was very pleasing to see the St Georges Episcopal Church under the leadership of Father Ronald Branch last year with a wonderful entry in the August Monday parade in 2013. “I look forward to seeing them again, along with many other churches, joining the Virgin Islands,” Hon Walwyn said. Myrun needs to get with the times because eyeleen gah he one way. more usual talk and nothing there!!! I don't care what anyone says. This should be a great opportunity for our country. People are SOO negative. Why when given the opportunity would locals not step up to support their own. This is a wakeup call for our community to STOP depending on other islands to give us entertainment for our country. We are going in the right step to making this our festival again. Instead of complaining ayo need to be apart of the solution. Getting so tired of you people. KEEP UP THE GOOD WORK!